The city of murals has inmates to thank for their hard work splashing color on community walls. Courtesy InterAct Theatre City of Numbers: Citizens in Action featured Mayor Michael Nutter, Mural Arts Program Director Jane Golden, District Attorney Seth Williams, Chief Defender Ellen T. Greenlee and Deputy Mayor for Public Safety Everett A. Gillison. “The proudest moment in my life was when I was sued by the [National Rifle Association],” Mayor Michael Nutter said to applause and laughter from the audience at a Feb. 15 panel on crime in Philadelphia called City of Numbers: Citizens in Action. Seated next to four other Philadelphia leaders on the main stage of the Adrienne Theater on Sansom Street, Mayor Nutter gave a response that answered many different questions, which came from Philadelphia citizens instead of the city’s reporters. The panel was hosted by the Mural Arts Program and InterAct Theatre Company. 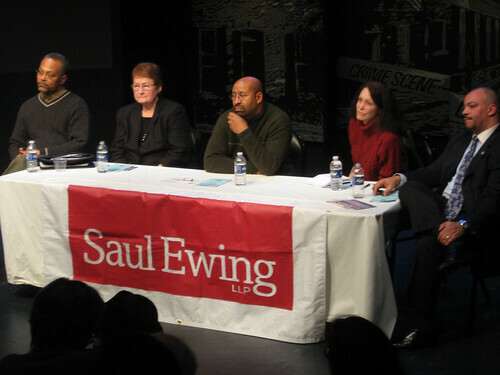 Nutter, District Attorney Seth Williams, Chief Defender Ellen T. Greenlee and Deputy Mayor for Public Safety Everett A. Gillison convened with Jane Golden, executive director for MAP, for Citizens in Action, one of many events in connection with City of Numbers: Mixtape of a City, a new play commissioned by MAP. With a grant from the Violette de Mazia Foundation, the play was created by playwright Sean Christopher Lewis to portray the lasting impact of MAP’s restorative justice program. Dave Davies, senior reporter for WHYY, moderated the panel and asked open-ended questions that allowed the panelists to share different aspects of crime and what they each do to prevent it. Audience members heard firsthand the responsibilities from each city official. Williams prosecutes criminals; Greenlee defends for the public interest; Gillison oversees Philadelphia’s police force, fire departments and prisons; and Mayor Nutter makes the policies that affect them all. Golden explained MAP’s role in criminal rehabilitation through art and its impact on the community. Through different programs, 30 to 40 selected inmates per year are employed painting murals throughout Philadelphia for 50 cents an hour. But, Golden said, the pay is less significant than the effects painting can have on the inmates themselves. On Nutter’s annual visit to each of Philadelphia’s prisons, he was able to witness the process firsthand. MAP’s restorative justice program is specifically designed for ex-inmates reentering society. “Ex-inmates are encouraged to apply for our reentry program, and most of them have been involved in our art instruction program while incarcerated,” Robyn Buseman, the restorative justice program director, said. When admitted into the program, ex-inmates receive training from muralists, attend workshops and paint and install murals. This program has contributed to approximately 20 murals. Other programs conducted by MAP in the past have involved sessions where inmates spoke with at-risk youth about their experiences. But these programs were discontinued about three years ago when the Pennsylvania Department of Corrections put in place a new policy that prohibits youth under the age of 18 to participate. Golden said that hearing directly from inmates what life in prison was like really opened the eyes of a lot of youth who would have otherwise been lured into crime. Nutter and Williams agreed. Williams said 85 percent of homicides in Philadelphia are due to gun violence; nearly all the criminals involved never graduated high school. When the panel finished, Davies opened up the floor for a question-and-answer session. At least half the audience members’ hands went up, with questions on MAP and drug and handgun policies. It isn’t difficult to illegally obtain a handgun, panelists explained. People who couldn’t legally buy one in Philadelphia could easily get one in Florida, where gun-control policies are less strict, Gillison said. Some bars in Philadelphia even rent handguns, he added. After Citizens in Action concluded, some officials lingered for a few minutes to talk to citizens. Andrew Davies, 26, said the panel changed his view on Philadelphia’s government. Manuel Agurto can be reached at manuel.agurto@temple.edu. A person who cannot legally buy a handgun in PA cannot legally buy a handgun in FL. That is pure rubbish. First of all, the federal background check is the same everywhere. Secondly, you must be a resident of the same state where the final transferring FFL is located. If a PA resident sees a handgun he wants in a FL gun store, the FL gun store must sent it to a PA gun store to complete the background check. Now if you’re talking about somebody who is going to ILLEGALLY buy a gun, then all bets are off because that person is breaking the law so how would more gun laws stop then?